Home / Opinions / Ukraine: Has the EU forgotten its biggest advocate? This summer is extremely challenging for the European Union. Apart from the refugee crisis and the overall rise of far-right movements – which were already there from the previous months – Brexit, terrorism attacks in France and Germany, the failed Turkish coup and Erdogan’s autocratic tendencies undermine the Union’s ability to stay cohesive and deal with this tense situation. The instability beyond the Eastern border is still there. Although not so much covered by the EU’s media lately, war in Ukraine continues, people are wounded and killed almost every day. Has the EU already forgotten its biggest believer – Ukraine? It should not be forgotten that the conflict in Ukraine, which has already cost more than 9,500 lives, started from Ukraine’s desire to integrate the European Union. 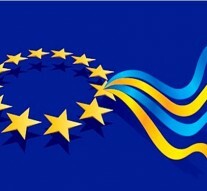 Ukrainians were the first people to die under the European flag. At the time, when many nations are dissatisfied and want to leave the EU, Ukrainians still believe in European values and dream to join the EU. In order to solve the conflict, the EU supported Ukraine financially, advisedly, and using its soft power. The Minsk agreements, sanctions against Russia and the financial help for the Ukrainian state are the biggest achievements. However, the war is not finished in Eastern Ukraine and Crimea is still under Russian control. Read “Ukraine wins Eurovision 2016 Amid Russia’s Criticism” for more information. The frozen conflict has become hot once again this summer. According to a UN report, the number of civilian casualties in the conflict area in Eastern Ukraine in June this year was the biggest since August 2015 – 12 civilian died and 57 were injured. Pro-Russian separatists and Ukrainian armed forces accuse each other of violating a fragile ceasefire in the Donbas. UN states a “pervasive impunity” is spreading and very few people incur punishment for various offenses, some of which are war crimes. Investigations are still going on. In one case, for example, the Office of the United Nations High Commissioner for Human Rights (OHCHR) acquired forensic evidence that a six-year-old girl was killed with her mother and grandmother by gunshots to the head in the Luhansk region, controlled by separatists. Reports suggest the girl and two women had been abducted by the rebel militia of the unrecognised “Luhansk People’s Republic”. The Intelligence of Ministry of Defence of Ukraine reports that Russia has sent dozens of tanks and 6 wagons with ammunition in the Donbas on 30th July. A Ukrainian soldier died and another one was wounded as of the day of 30 July. The example of a single day presents the reality of the ongoing war. The situation in the rest of the country is far from secure. On 20 July, a 44-year-old famous Belarusian journalist, Pavel Sheremet, reporting about the conflict in Ukraine, was killed by a car bomb in Kiev. At present, no perpetrator has been found. Ukraine has asked both the United States and the European Union for assistance in finding the murderer. After 2 years from the MH17 tragedy, those responsible for the crime have not been brought to court. Dutch prosecutors are still waiting for Russia to provide data on the shooting of the MH17 flight. According to the West and Ukraine, Russian-backed rebels hold responsibility, while Russia accuses Ukrainian forces of the same crime. A Dutch report from last year concluded that the plane was downed by a Russian-produced Buk missile, but did not say who fired it. On 26 July, Ukraine’s President, Petro Poroshenko, hold a telephone call with the German Chancellor, Angela Merkel. Poroshenko expressed his big concerns as to the increasing number of shootings in Donbas and the fact that Russia keeps sending weapon to Eastern Ukraine. He also asked for European help in releasing of Ukrainian political prisoners hold in Russia, for the implementation of the Minsk agreements and for a faster visa-free regime with the EU. For more information on the EU-Ukraine issue on visa, read “EU to Grant Visa-free Travel to Ukraine’s Citizens Despite Dutch Referendum“. Many vital reforms in Ukraine were done for visa liberalization with the Union. It was awaited this summer but due to the inside situation in Europe it was delayed for autumn. While most EU’s citizens are against the enlargement, Ukraine is looking forward for more steps in this direction. According to Geoffrey Pyatt, American ambassador to Ukraine, the new escalations of fights in Eastern Ukraine are due to Russian sending of military equipment to the separatists. He stated that Ukraine implements Minsk agreements far better than Russia. While a group of French deputies visited Crimea, tensions rose, as the leader of the delegation, Thierry Mariani, is well known for his pro-Russian positions. The French Ministry of Foreign Affairs, Jean-Marc Ayrault, condemned the visit and said such an initiative is illegal and has nothing to do with French official position. The occasion was used by Russia to promote the world recognition of annexation. Lately, the EU’s sanctions on Russia because of its aggression against Ukraine’s territorial integrity were prolonged. However, according to the German minister of foreign affairs, Frank-Walter Steinmeier, the mitigation of sanctions against Russia is possible, although the war is going on. If the progress in implementation of Minsk agreements is reached, sanctions can be gradually mitigated, he stated. The EU is losing its interest in Ukraine. Does it mean that the Union, while concentrating on its inside problems, is unable to be a global player anymore? The EU cannot afford itself such a scenario, as there are countries that believe in the European integration and prove it on battlefield. If the Union is not to support them more, then the European project is definitely going to fade. Next Article » What is at stake in the new EU Strategy on China?